When I saw the first preview for this movie I actually moved to the edge of my seat on the couch and made audible “ooohs.” The costuming, cinematography, and sweeping scenery shown in the previews gave my imagination all it needed to create an amazing world of anticipation. This movie was MADE for the big screen. The film is cinematically gorgeous. The locations, lighting, and set dressing of this film are undeniably mesmerizing. The costuming is, well, visually orgasmic. The characterization is well done, and I have to say I love that they made Queen Ravenna so deliciously evil with a delightfully sympathetic edge. At first I got a little irritated by the blatant use of fantastical elements as plot devices, but my movie-going companion was quick to soothe my ire by simply saying, “It’s a fairy tale, remember?” And, because I go to the movies to be entertained, I relaxed and let the story unfold and entertain me. 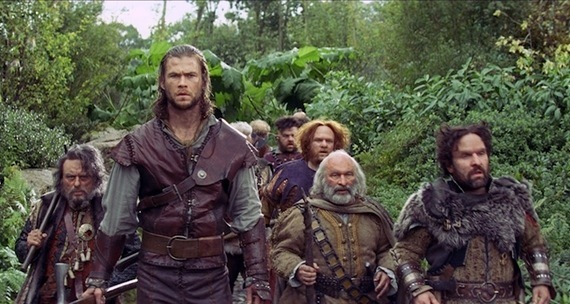 I was pleased that the dwarves (there were 8, instead of the usual 7) were used in a more reverent way than is typical in tellings of the Snow White story. They weren’t comic relief, although they were humorous, and they weren’t portrayed as half-effective half-men as they often are, but rather integral members of the party and their size and peculiarities were used to an advantage. The director used the CGI budget well, in that he got quality graphics that were well blended. I felt that some of it was over-the-top and unnecessary, but I enjoyed it nonetheless. While it was obvious what was real and what wasn’t (based on my experience of living in reality), I was able to easily forgive and just wish such things actually existed. The troll, in particular, was stupendous. 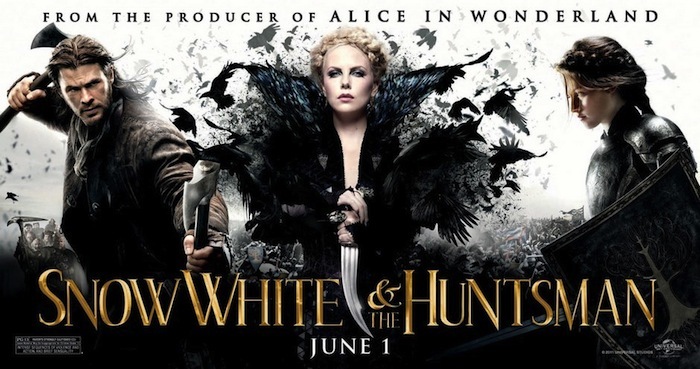 Charlize Theron completely owned this movie as the evil Queen Ravenna. And, while I found her name to be a bit too literal, she was so carefully created and portrayed that I found myself wishing the movie was about her so she could be in every scene, and not just because she had, by far, the best costuming in the entire film. The Queen, as she is shown in this movie, is a deeply disturbed, oddly enchanting creature. She is the stuff nightmares are made of. I could go on and on about the costuming, specifically the queen’s outfits which are so gorgeously morbid with their memento mori themes and rich fabrics, but you really must see them to fully appreciate them. I was glad to see them use real armor pieces for Snow White’s outfit in the battle scene, it definitely gave her a harder edge that allowed me to accept the strong princess ideal that is creeping its way into modern fairy tales. It seemed to me that the costume designer took the time to match the clothing to not only the character but also the actor portraying the character, which went a long way to creating the right atmosphere for the film. There are a few plot twists and some fair license taken with the traditional storyline, but they work and I liked being pulled out of my own assumptions of “oh, I know what’s going to happen next, because I know the story.” It isn’t your average Snow White tale. She isn’t just a princess of royal blood needing saving. The story actually seemed to lean a bit more towards it being a tale of The Huntsman and his journey toward salvation. Lest it not be a complete and thorough review without a critique of the lead actress, here is all I shall say on the matter: Kristen Stewart is not a stellar actress, but she didn’t annoy me in this as much as I expected. Partly because she really didn’t have that much dialog, but mostly because I was too busy enjoying everything else in the movie to notice. Her accent was spotty, and her tendency to always look like she is sneering was rather unsettling, but there were times when she smiled or closed her mouth completely and just reacted to the story being created around her that turned my general dislike down to an ambivalent acceptance. Last, but not least, I would like to give due respect to James Newton Howard for his orchestral scoring of this movie. The music was brilliant and well crafted for this movie. I could feel the story through the score and it was an added layer of immersion that let me get lost in the land of Once Upon A Time. I used to buy a lot of movie soundtracks and haven’t done so in a while, but this one is going on the Must Own list. I will definitely be purchasing the DVD of this movie and will probably spend countless hours freezing the picture on shots of The Queen to ogle her spectacular clothing. I really hope they include special features that include a spot on the costuming and design. I desperately want to make something with feathers and animal bones now!